Further details are now leaking out regarding the story I reported last week of two settlers accused of terrorism. Then, the case was under gag order in Israel and I reported that two of the accused were Pini Shandorfi and Shneur Dana. At that point there was only one other known suspect who was a minor, and whose identity was not reported (curious Israeli authorities offer more privacy to Jewish minor terror suspects than Palestinian ones like Ahmed Manasreh). 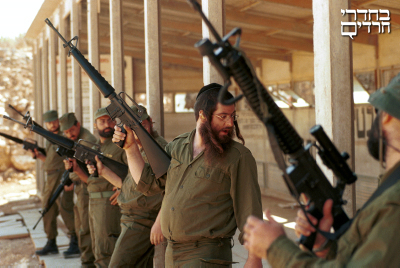 Pini Shandorfi during IDF training. After refusing orders to evacuate an illegal outpost he was cashiered from army service. Chaim Levinson has just reported in Haaretz that seven suspects were arrested, three of whom serve on active duty in the IDF. Three of the detainees are also brothers. From the Facebook post described below it would appear that the three brothers are Pini Shandorfi and two of his siblings. Five of the seven suspects are now imprisoned. A total of two of the seven arrested are minors. Kahanist former MK Michael Ben Ari published an appeal in his Facebook page from Elazar Shandorfi, a cousin of Pini Shandorfi. Elazar attempts to rouse indignation at their arrest by noting that one currently served and another is an IDF veteran, that they are married. One of them ‘even’ has four children. As if all of those things mean a man would not kill a Palestinian given half a chance; or perhaps that such good Jewish men should be forgiven whatever they’ve done because they did it for a good cause: the Jewish people. He inveighs with righteous indignation against a Shabak search of their homes–“as if they were terrorists, God forbid.” He even boasts that because of his family’s sacrifices on behalf of poor, wayward children, under other circumstances his family members would merit the Israel Prize!! How ironic that Shandorfi decries the “dark regime” of the Shabak and court system which have conspired to steal the freedom of his cousins. When the power of this regime is unleashed on Palestinians, he doesn’t seem to mind one iota! I would be more far more sympathetic if I heard even a murmur of disapproval from Shandorfi when Palestinians are in the gunsites. In an article heavily restricted by a security gag order, Haaretz is hinting around the edges that Shandorfi and other suspects were either involved in the original Dawabsheh arson attack, which killed three family members; or more likely they are being charged with setting a subsequent fire at the home of the brother of Saad Dawabsheh. I noted this theory in my earlier post about the Shandorfi-Dana arrest. Dawabsheh’s brother is the only eyewitness to the original attack and saw the murderers, which is why the settlers would wish to intimidate or kill him. If I was a betting man I’d bet a few thousand dollars that my hunch is correct.